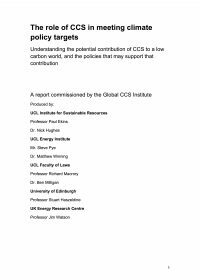 There is considerable agreement among experts that Carbon dioxide Capture and Storage (CCS) is a vital mitigation alternative for the coming decades. The potential of such technologies to reduce CO2 emissions from fossil fuel power generation is substantial. In addition, a transfer of CCS technologies from industrialised to developing countries can help ensure a more sustainable economic development. Emissions of greenhouse gases are expected to cause climate change. The main greenhouse gas is carbon dioxide (CO2) and the major source of it is the combustion of fossil fuels to supply energy. Emissions can be reduced by a variety of measures, such as improving energy efficiency and developing alternative energy sources, like wind and solar power. However, a rapid move away from fossil fuels is unlikely as energy supply infrastructure has a long lifetime, and such a move could destabilise economies. Another way to reduce emissions is to capture the CO2 that is released from fossil fuel-fired power plants and store it underground. This is the focus of this report, as power generation accounts for about one-third of CO2 emissions from fossil fuel use. The current leading technologies for power generation are pulverised fuel (PF) combustion steam cycles and natural gas combined cycles (NGCC). The IEA Greenhouse Gas R&D Programme (IEA GHG) has assessed the performance and costs of these power plants, both with and without the capture of CO2. Integrated Gasification Combined Cycle (IGCC) for the gasification of coal, which was included in the assessment, may be a suitable technology from which to capture CO2. A number of criteria were specified for all the studies to enable the results to be compared in a meaningful manner. The main specifications are listed in the Annex at the end of the report. The Sleipner project is a commercial CO2 injection project and proved that CO2 capture and storage is a technically feasible and effective method for greenhouse mitigation. It further demonstrates that CO2 storage is both safe and has a low environmental impact. Monitoring is needed for a wide variety of purposes. Specifically, to ensure and document the injection process, verify the quantity of injected CO2 that has been stored by various mechanisms, demonstrate with appropriate monitoring techniques that CO2 remains contained in the intended storage formation(s). This is currently the principal method for assuring that the CO2 remains stored and that performance predictions can be verified. This paper presents a high level view of the key policy options for regulating CO2 capture and storage (CCS) activities in the EU. Also outlined are some suggested issues and amendments to existing EU legislation that will be required in order to clarify their scope, confer their provisions or remove them as potential barriers. 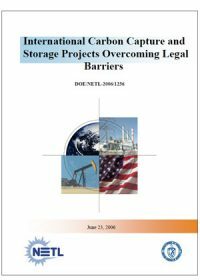 This article attempts to provide an update on recent developments in carbon capture and storage (CCS), with particular emphasis on the legal and regulatory provisions that will need to be in place under international, EU and UK law to accommodate the new technology and the risks of storing CO2 underground. This involves looking at how some of the recent developments link to the London Convention and its protocol, OSPAR, the UNFCCC and the Kyoto Protocol, and how the UK Government might proceed with regulating and licensing CCS in the United Kingdom. This paper provides an up-to-date examination of a number of key existing CCS legal mechanisms and regulatory options at EU and international level and proposals for their change, which it is hoped, could eventually resolve some issues of legal ambiguity. 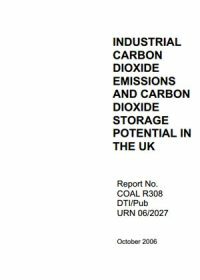 This report, funded by United Kingdom Department of Trade and Industry, considers the UK’s emissions of carbon dioxide from large industrial point sources such as power stations and the potential geological storage capacity to safely and securely store these emissions. As part of the USDOE's Carbon Sequestration Program, an integrated modeling framework was developed to evaluate the performance and cost of alternative carbon capture and storage (CCS) technologies for fossil-fueled power plants in the context of multi-pollutant control requirements. The model (called IECM, for Integrated Environmental Control Model) also allows for explicit characterization of the uncertainty or variability in any or all input parameters. Power plant options currently include pulverized coal (PC) combustion plants, natural gas combined cycle (NGCC) plants, and integrated gasification combined cycle (IGCC) plants. This paper uses the IECM to analyze the effects of adding CCS to an IGCC system employing a GE quench gasifier with a water gas shift reactor and Selexol system for CO2 capture. Parameters of interest include the effects of varying the CO2 removal efficiency, the quality and cost of coal, and selected other factors affecting overall plant performance and cost. The stochastic simulation capability of the model also is used to illustrate the effect of uncertainties or variability in key parameters. 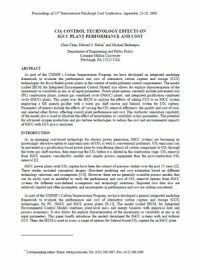 The potential for advanced oxygen production and gas turbine technologies to reduce the cost and environmental impacts of IGCC with CCS also is analyzed. This paper examines regulatory developments of major CCS projects to determine actual progress in regulating such projects. 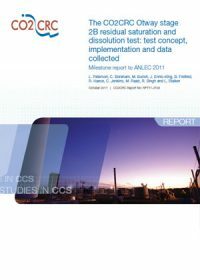 There are five case studies of CCS projects that range from enhanced resource recovery to direct storage and which have been developed for a mix of purposes, such as commercial, research and development, and pilot demonstrations. These case studies indicate that regulatory progress varies greatly among projects, and differs depending on the size, scope, and the location of the projects. The focus of this report is the legal and regulatory context for international projects, but it should be recognised that CCS field projects in the United States are also addressing many of the regulatory issues related to CCS.